The ABP Group is a media conglomerate that has eleven premier publications, three 24-hour national TV news channels, two leading book publishing businesses as well as mobile and internet properties. Touching the lives of millions of readers and viewers, daily. The present assignment was for the English daily The Telegraph. 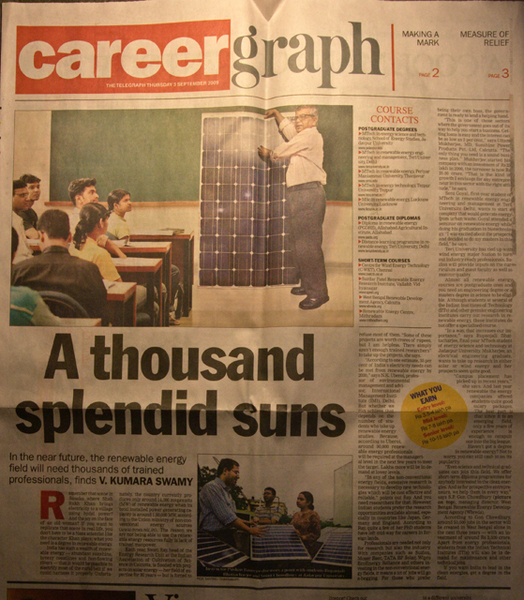 The story was about the career scope in the area of renewable energy. As the photographer on assignment I had to communicate with the scientists to arrange for the photo sessions. The solar eclipse of July 22, 2009 was the longest one of this century and most of it was visible from India. On this occasion Globe and Mail published a story about how eclipses in Indian society traditionally are accompanied by a lot of superstition but science groups are trying to use this occasion to get people to engage with astronomy. In the story renowned eclipse chaser Mr. Debashish Bose was featured as a representative of this new India. As a photographer on assignment my responsibility was to arrange a day-long photo session with Mr. Bose and take photographs to accompany the story. The story was published on 20th July in Globe and Mail. Proficient in developing welformatted slide presentation using graphics, charts, flow diagrams, etc. with Microsoft Powerpoint. Proficient in creating welformatted documents using graphics, styles, etc. with MS Word. Have good exposure in OpenOffice software suite for laying out pages and developing professionally designed PDF documents. Have good exposure in JAlbum software for creating professional looking slideshows for the web or for sharing in a CD. Extensive operational knowledge of full manual mechanical cameras like Leica CL rangefinder camera or Pentax SLR camera. Extensive operational knowledge of automatic or semi-automatic cameras like Hexar AF. Capable of making near correct exposure without any help of light meter both in day light and night street light situations. Have very little exposure in wet lab processes in photography. Proficient in handling digital SLR cameras with a vivid knowledge of different controls to facilitate picture making even in trickier lighting condition. Proficient in RAW image file processing using Lightroom 1.1, Photoshop and other RAW processing software. Extensive knowledge of image touchup techniques in Lightroom 1.1 and Photoshop for efficient image file editing. Installed an effective and integrated digital workflow that allows for efficient management of image files and their metadata, and batch upload on the web. Although I am mostly self-taught in photography, I took part in a four months long intensive weekend workshop run by one of the renowned photographers from Kolkata, Mr. Madhu Sarkar, in the year 2005. In the workshop I was taught about theories of composition, artificial lighting techniques, still life shoots, model shoots and wet lab photography processes. Apart from that I keep brushing up concepts in Photography by reading books from The Focal Press, Kodak, The Fountain Press and the like. I also keep myself abreast of current concepts and techniques by reading available online resources like different blogs and ezines. The Indian Science News Association was founded in 1935 by Professor Meghnad Saha and Acharya P.C. Ray with an objective to disseminate science news and to communicate ideas of Indian scientists and thinkers for public understanding of science and culture together. To meet this goal the Association has been publishing a journal Science and Culture from its inception. In addition it organises seminars, symposia, memorial and endowment lectures etc. Since 1983 ISNA is conducting a course of 10-12 weeks duration on Science Communication and Media Practice for young aspirants who want to be science communicators. The course strives to give the participants exposure to basic journalistic techniques, responsibilities of a science communicator and working principles of audio-visual media. A technology intensive training that aims at developing a thorough knowledge of Computer Science and Information Networks. It imparts an indepth understanding of how computer technology can be applied to enhance the efficiency of different human efforts. One develops a vivid idea about the methodologies for effective and efficient collection, processing and dissemination of information/content using network technologies. In totality it prepares a participant to take up challenges in this modern digital era. I am fascinated about telling stories through my photographs. Hence I am most attracted towards street photography and documentary photography. Through my photographs I want to tell stories about human life, culture and human societies. Dynamics of cultural evolution and human identity, interaction and inter-relationship between a culture and its environment, and the mechanism of responding to the forces of changes from the outside world attracts me most. However I am also interested about artificial lighting techniques and hence I also enjoy doing still life and portraiture. I maintain a journal of my works, my ideas about photography and anything interesting that I find on the net in the blog http://thecamerawala.blogspot.com/. I am a member of the greatest online professional photographer's community: Lightstalkers.org. To see my profile on the site please visit http://www.lightstalkers.org/santanu_chakrabarti and a portfolio of my work at http://www.lightstalkers.org/galleries/contact_sheet/10238. I am also a contributing member of Photojournale, a site for "photo documentary from around the world" and a collection of my recently uploaded photographs can be found at: http://photojournale.bladepicturecompany.com/categories.php?cat_id=105. I have a collection of my photographs, on Bengali year ending celebration, uploaded as a part of my VII VISIONAIRES profile and can be found at http://viiphoto.ning.com/photo/photo/listForContributor?screenName=2difs7u8edre9. You may also like to visit the archive of my photographs at Flickr: http://www.flickr.com/people/camerawala/. You may also like to network with me at Facebook. As a freelance photographer I am always ready to tread that extra mile that makes my clients happy while strictly following the ethical standards of the profession. To grow professionally I would like to hone my skills as a visual content developer and to apply it to educate and inform people in an effective and entertaining manner about various issues concerning life in this world.